Years ago I had seen a recipe for a Dutch Baby in a cookbook and it seemed too complicated. I knew a Dutch Baby was basically a breakfast popover and to me, that sounded delicious. I never bothered to try and make one. This past holiday season I had seen someone make a Dutch Baby on a television show and I thought, that didn’t seem so hard, I need to try that. Then I was asked to review Breakfast the Most Important Book About the Best Meal of the Day by the editors of Extra Crispy, and there were 3 Dutch Baby recipes in the book. The authors called it the “Little Black Dress of Breakfast. This year for Christmas we weren’t going to my sister’s house til noon. Aaron and Summer were spending the morning with Summer’s side of the family so we invited Jordan and Savannah over to our house for Christmas breakfast. 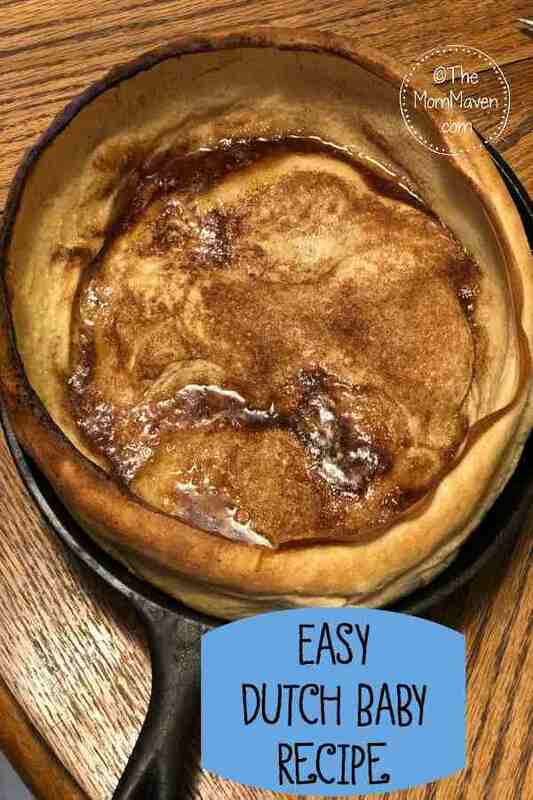 Ron cooked bacon and eggs and I made a Cinnamon Sugar Dutch Baby and it was easy and delicious! Breakfast (Oxmoor House, October 23, 2018, $25.00), a hardcover full-color guide to the vast world of breakfast and brunch by the Editors of Extra Crispy. The first book from the popular website Extra Crispy is packed with more than 100 photos, illustrations, infographics, cooking tips, and amazingly crave-able food. It’s the perfect gift for anyone who loves to eat breakfast food for breakfast, lunch, and dinner. Extra Crispy is the authority on breakfast and brunch, but it’s so much more than recipes. Extra Crispy will teach you how to poach an egg, followed by a discussion on how to feel about poaching eggs. The website covers the history of food, foodways around the world, and the chefs inspiring and changing the food industry, along with cooking tips and videos. Extra Crispy’s stories are personal, opinionated, and sometimes on the fringes of the food media landscape. The site showcases celebrity chefs and emerging voices from around the world, and behind it all is a sincere celebration of breakfast food and the culture surrounding it. Extra Crispy is a Meredith Corporation brand. This book is so much more than a cookbook. It is informative and entertaining as well. There are so many recipes in this book that I cannot wait to try! 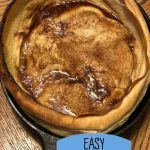 The Dutch Baby is the little black dress of breakfast and this recipe from "Breakfast, the Most Important Book About the Best Meal of the Day" is so easy to make. Prepare the Skillet: Preheat oven to 425°F. Remove skillet from oven and add 2 tablespoons butter, swirling until melted. Pour Batter into skillet and return to oven. Bake until golden and puffed up dramatically, 12-15 minutes. Prepare the Cinnamon Sugar: Combine sugar and cinnamon in a small bowl or jar and whisk to combine. Set aside. Return to oven and bake until sugar sets, about 5 more minutes. Top with a scoop or two of ice cream, (or whipped cream) if desired. We all enjoyed this addition to our Christmas morning and I will make it again, and maybe some other variations…I’m thinking a S’mores Dutch Baby is in our future. 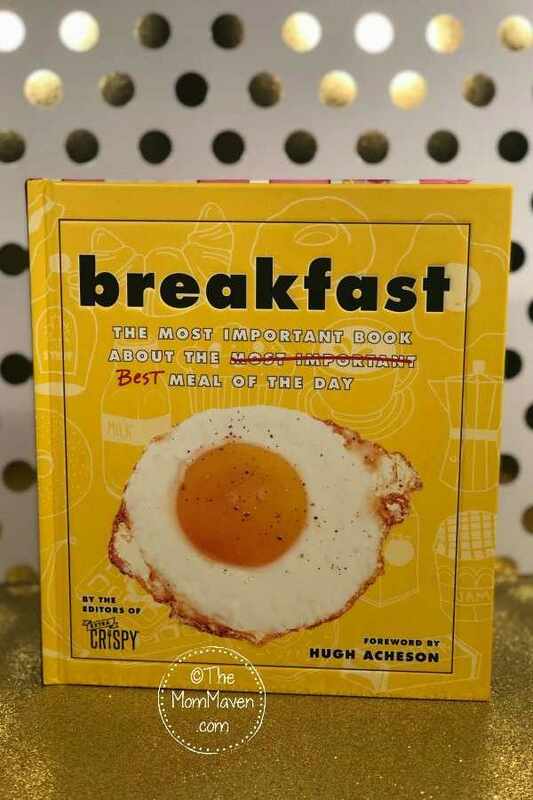 Pick up your copy of Breakfast the Most Important Book About the Best Meal of the Day so that you can take your breakfast from basic to bougie. I hope you enjoy this recipe and all of the easy recipes I share here on The Mom Maven. I hope you share them on your social networks. I just ask that you not copy and share the entire recipe with photos. Please use the sharing buttons below and share the link to this post. Thanks!